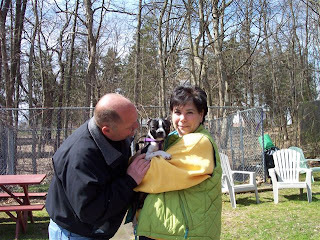 Here are JJ's new parents. They came today to pick him up. Looked like love at first sight to me. 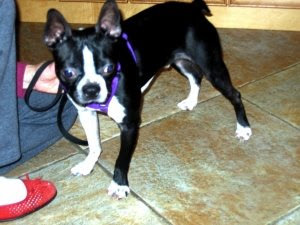 "JJ is a Boston Terrier pup, about 9-10 months old. He's in excellent health and very active. JJ would do best as an only, adored, pup with an owner who wants to give lots of love and play time to a willing student. JJ is completely house trained, walks very well on a leash and knows basic commands such as "sit, stay, and come". JJ is not food aggressive or toy aggressive, but WILL chase cats and "wee animals that run". This boy must only be taken out while on a leash. JJ CAN and WILL jump a low fence to chase after an animal. He is trained to be toileted while on a leash. JJ is a wonderful pup who needs a person to love him forever. If you are ready for a committment to give and get love for a long time, then JJ might be just the companion dog you'd want. He must have a sweater on in cold weather, and should not be exercised in very warm temperatures. This is true, of course, for any animal that has a thin, single coat." I promise I will take your unwanted animals. I will heal their wounds, their diseases, their broken bones. I will give them the medical attention they need and deserve. I will nurture their starvation and give them a warm place to sleep. I will spay and neuter them, vaccinate them against the diseases that can harm them. I will treat them and honor them. I will buy them toys, blankets, balls, and teach them to play. I will speak softly to them. I will try to teach them not to fear, not to cry, and not to hate. I will whisper sweet, kind, gentle words into their ears, while gently trying to stroke their fear, their pain, and their scars away. I will face their emotional scars and give them time to overcome them. I will socialize them, potty train them, teach them to be obedient, show them dignity, and hold their paws, and stroke their ears if they have endured too much and walk them over the Rainbow Bridge, BUT most of all I will teach them Love.